The other day my brother asked me how to make bruschetta. Although tomatoes aren’t quite in season yet, they’re starting to pop up at the market. I have found that the key to making tasty bruschetta is to let the tomatoes marinate in olive oil and salt for a little before mixing in any other ingredient. I don’t know if this is the traditional way to make it, but it sure tastes good. Remember when you are storing tomatoes to keep them on the counter top. If they go in the fridge their flavor will change. Slice bread into even slices about 1″-1 1/2″ thick. Brush olive oil on both sides of bread. Make sure both sides of bread are even so that when you are toasting, parts of the bread doesn’t burn while other parts don’t even cook. Toast in pan until both sides are crispy and brown. Remove from pan and let rest on paper towel. Dice tomatoes into small/medium size pieces. You don’t want the pieces to be too large, but not too small either. In a large bowl mix together tomatoes, lots of olive oil, salt. Let tomatoes marinate for about 20 minutes (or longer if you can stand it). I like to use fresh feta, but you can leave it out if you don’t eat dairy. Cut feta into small pieces and mix in with tomatoes. Top bread slices with tomatoes/feta, sprinkle freshly chopped basil on tomatoes. sprinkle of basil $2.99 for the whole container, but you only use a tiny amount…keep the rest and make pasta sauce…. For you brother, I will go over budget. yum! this is one of my favorite summer foods. 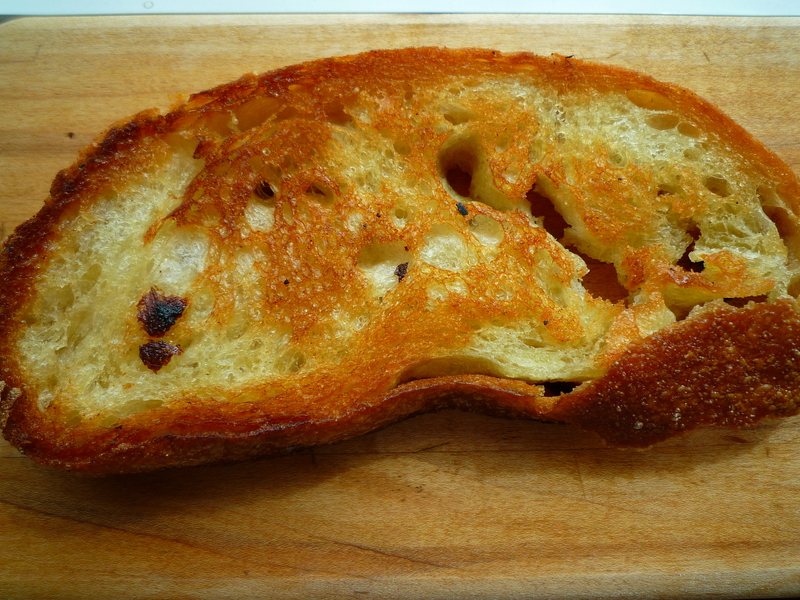 the key really is to toast the bread exactly right – not too hard and not too soft or it will fall apart. beautiful photos!! mmmm looks delish! my italian uncle swears by using 2-3 day old bread, says it comes out amazing that way! 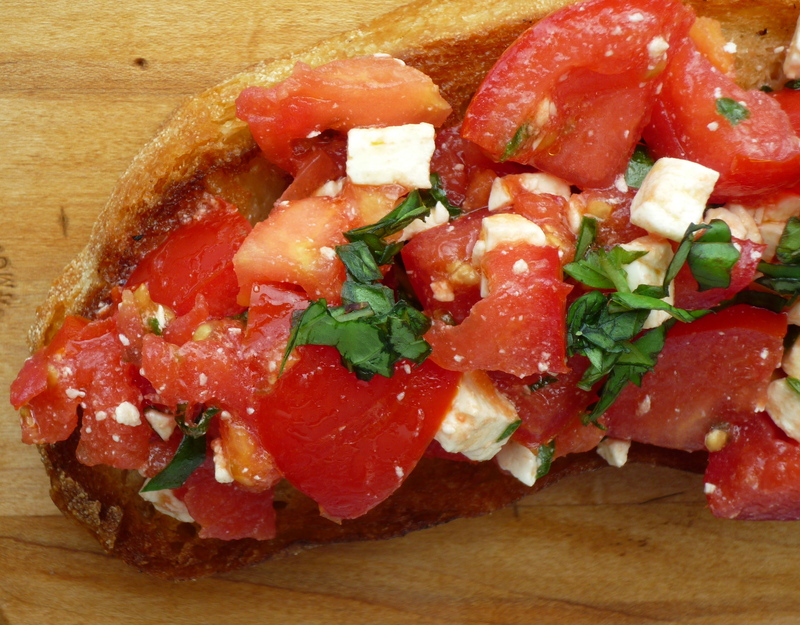 bruschetta is a perfect summer treat. also, while i don’t know about 2-3 days, i definitely vouch for the day-old bread recommendation! didn’t know about the tomatoes in the fridge thing — good to know! can’t wait to taste this. your brother and the rest of us are very happy!